November is Alzheimer’s Awareness Month in the United States. Alzheimer’s is a frightening disease. It is frightening not only for those who suffer from memory loss, but also for their loved ones. But researchers in California say a new way of treating Alzheimer’s disease is showing promise for reversing some of that memory loss. The new treatment combines western medicine with eastern philosophy – ideas rooted in Asian religions. This 55-year-old woman has suffered from progressive memory loss connected with early Alzheimer’s. She is still working as a lawyer, but does not want her name publicized. The woman is one of 10 patients who received a new treatment for memory loss at the University of California, Los Angeles. Dr. Dale Bredesen is with the Easton Center for Alzheimer’s Disease Research at UCLA. He says nine of 10 patients suffering from either Alzheimer’s or other disorders of the brain noted improvements in their memory. He says the new therapy treats the whole patient, not just parts of the patient. This is called holistic care. Dr. Bredesen says the traditional use of only one treatment, what he calls “monotheraphy,” just did not work with many patients. Dr. Bredesen says there is a constant balance of the brain remembering and forgetting. He says many things, including a person’s lifestyle, can create an imbalance in brain activity. And this imbalance can lead to memory loss. The thirty-six different parts or elements include a person's diet, exercise and sleep. Dr. Bredesen creates an individualized treatment for each patient. He does this by taking images of their brain, testing their blood and asking many questions about their daily life. Treatments include lifestyle changes and even medicines or vitamin supplements. He describes this new therapy as combining western understanding of the human body with the eastern method of looking at the whole patient. As for lifestyle changes, subjects were told to avoid carbohydrates, like bread and pasta. They also avoided processed foods and gluten, a protein found in wheat. Researchers told subjects to eat more fish and to take vitamin B12, D3 and fish oil. They also practiced yoga, sat quietly for 20 minutes two times each day and they slept more. 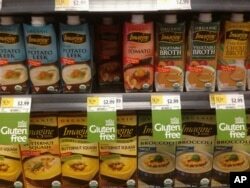 Gluten-free products on store shelf. Dr. Bredesen says for the nine patients whose memory improved, it usually happened within three to six months. He says the 10th patient was too far along in the disease for any improvement to be observed. The UCLA center is now working with 30 additional patients as it moves to expand its research. The researchers say they followed some patients up to two and a half years and the memory improvements remained. *This report was based on a story from VOA’s Elizabeth Lee in Los Angeles. Anna Matteo wrote this story for VOA Learning English. The editor was George Grow.